Imagine a gourmand paradise where miniature cherry-topped pastries are marketed as Virgin’s Breasts and a gorgeous layering of pudding, pastry dough, and preserves created by cloistered nuns is the coveted Triumph of Gluttony. Of course, I’d come to Sicily hungry (how else? ), alerted by traveling foodies to a new generation of inspired chefs tweaking the traditional, and obsessed with digesting the island’s history through its food. I was eager to taste high-risk improvisations like the smoked lavender-cod pyramids of Ciccio Sultano, “Italy’s Best Young Chef,” in the estimation of the magazine Gambero Rosso. I’d heard that Corrado Assenza’s cutting-edge bravado and exotic flavorings in honey, chocolates, and marmellatas at Caffé Sicilia would startle my sensibilities. And everyone was talking about the fantasy tasting menu at Il Mulinazzo, not far from Palermo. I was especially excited to try the powerful Sicilian wines that were winning prizes and showing up on menus across New York. And so I arrived, ready to immerse myself in the island’s rich tradition now punctuated by the shock of the new, carrying a list of must-eat addresses that would have had us eating a zigzag across Sicily. My guy’s must-sees included the island’s usual wonders: Greek temples, Roman mosaics, Baroque cathedrals. I hungered to taste the mythic lemons, the capers of Pantelleria, the eggplant (in caponata and in spicy pasta alla Norma), the famous rolled-and-stuffed sardines a beccafico, Trapani’s seafood couscous, and, yes, I was primed to dare the spleen panini of Palermo. It was an ideal moment to arrive: the week before Easter, when the country vibrates with pagan and religious rituals in every town and it’s still cool and green, fields wild with flowers before searing summer turns everything brown. Marzipan lambs grazed in every pasticceria window. By the time I’d tasted almond-paste goodies (an Arabic legacy) from every shop on Taormina’s main street, with a stop at the Greek theater, we’d had enough of the town’s tourist clots. We headed toward Catania to meet friends at Sicilia in Bocca, hangout of actors and politicians, where at midnight on Palm Sunday a fisherman was just delivering a giant basslike spigolo—still in rigor mortis, it was so fresh out of the sea. We ate crudi—raw gamberetti and neonati (baby anchovies)—and what the house does best, pasta, surprised to discover the Sicilian habit of grating pecorino on seafood pasta. (Toasted bread crumbs were the traditional and deliciously nutty sprinkle for our pasta con sarde—with sardines and wild fennel—in a region once too poor to even think of importing Parmigiano-Reggiano.) Next morning we lingered long enough to explore Catania’s rowdy fish market, stopping at Caffé Europa for a typical Sicilian breakfast: hazelnut gelato in a doughnutlike brioche. Sicily is small, swiftly crisscrossed on the autostrada, letting you swing easily from the Greek-influenced eastern coast to the ancient ruins of Siracusa before settling into Palermo, as we did, using it as a home base for day trips and an occasional overnighter in our determination to feast and photograph. Perhaps less-food-obsessed travelers would have skipped driving in torrential rain to the triangle of the towns Noto, Modica, and Ragusa. But then they would have missed Baroque architectural marvels built after the area was ravaged by earthquakes in 1693. And each town is also a food-lover’s imperative. Modica harbors Antica Dolceria Bonajuto, a chocolate shop dating from 1880 with a small museum. Easter celebrants had cleaned out the bakery, so we didn’t get to taste the eggplant-and-chocolate-filled half-moons (lucumie) or the beef-and-almond-paste-stuffed impanatigghe. I was lucky to find a cinnamon bar of the house’s grainy and starkly bitter chocolate, still made from Ivory Coast cocoa beans using a secret Aztec recipe brought to the city centuries ago by wealthy Spaniards. The daring and passion of Corrado Assenza at the surprisingly plain Caffé Sicilia made it worth a soaking mad-dash from the car park in nearby Noto. We sat for hours tasting cakes, puddings, flowery custards, candied fruits, Sichuan-pepper-spiked cookies, and exotic honeys (chocolate, basil, saffron). There was only time to sleep it off before hitting the road to the Ibla half of Ragusa and a tasting dinner, best of our stay, at Michelin-starred Il Duomo. Daring and obsessed as are all the best contemporary chefs, Ciccio Sultano plays with odd combinations of classic Sicilian ingredients in a tiny house with cherub sconces aimed at the vaulted ceiling, casting soft light on us below. A puddle of wild-apple purée comes with a warm tortino of the local cacciocavallo cheese. The stunning pungency of lemon salad cuts through the richness of lightly smoked pork from black pigs. Settled into Palermo for a week, we spent mornings wandering through the legendary Vucciria market as well as our favorite, Ballaró, full of fussy shoppers. I bought peppered pecorino to take home for breakfast and stood in line at a cart for delicious innards stuffed into a crusty roll. When we’d walked enough to justify it, I’d buy a medium-size cup of bacia ]plus cioccolato under a drift of whipped cream at Stancampiano. At Antica Focacceria San Francesco, pani ca’ meusa, beef spleen stuffed into bread (plus an optional plop of ricotta), is dished up from a giant vat all day for local fans (I loved it, too). At Bye Bye Blues on a side street in nearby Mondello, we were surprised by the creativity in the kitchen and marveled at the delicious simplicity of raw fish with a ginger rice cake, layered anchovies and potato in caper sauce, and spaghetti with sea-urchin-and-fava purée. From Palermo, it’s not far to the salt flats of Trapani to watch the spring tuna hunt (if you can take the gore) and to climb the medieval winding streets of Erice, a hilltop town overlooking the Tyrrhenian Sea. 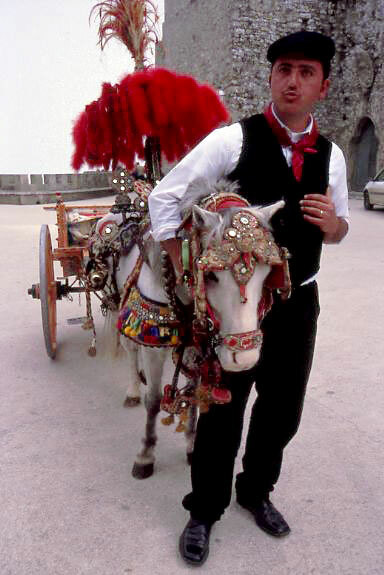 With so many tourists lined up to buy pastries from Pasticceria Maria Grammatico, a legend of Sicilian pastry, and a hokey donkey cart parked at the Norman castle above waiting to be photographed, it’s easy to dismiss Erice as slightly theme-park. So we were amazed at the good-natured welcome and smartly al dente ruffled ribbons of pasta in a meaty ragù at Ristorante Monte San Giuliano. Another evening, a new friend in Palermo, fourth generation of the Barbera olive-oil family, took us to Il Cortile, a small mom-and-pop trattoria in Custonaci near the sea, where we dined happily outdoors on the simplest, barely sauced pasta and boiled veal. One morning we set out from Palermo for the 90-minute drive toward the middle of the island to sit in on the cooking class Anna Tasca Lanza gives in the charming tiled kitchen of the Casa Vecchie, overlooking her family’s sprawling Regaleali vineyard estate. A tireless champion of the island’s kitchen tradition in her many cookbooks, she shaped and fried arancini (rice balls), sautéed slivered artichoke for our pasta, and made creating individual cassatas look easy. Tradition hits the fan at Il Mulinazzo, with its two Michelin stars, helmed by Nino Graziano, a veteran of several kitchens in France. It’s just south of Palermo in Villafrati, a quick drive for lunch. Even the tradizionale tasting menu shows off Sicilian cooking creatively rethought: elegant snapper tartare with oil and lemon on warm chickpea fritters, lasagnetta with sardines and wild fennel, almond couscous in a fish soup, rack of lamb with an asparagus zabaglione. Next day, I owed my guy a major Greek temple and an afternoon of mosaics. The Grand Hotel Villa Igiea is widely considered the best hotel in Palermo (from $360; 39-091-631-21-11). Cooking classes at Casa Vecchie cost $170 for a two-hour lesson with lunch (39-093-481-46-54). Restaurants: Sicilia (39-095-746-13-61); Caffé Europa (39-095-372-655); Il Duomo (39-093-265-12-65); Bye Bye Blues (39-091-684-14-15); Ristorante Monte San Giuliano (39-092-386-95-95); Il Cortile (39-092-397-17-50); Il Mulinazzo (39-091-872-48-70).